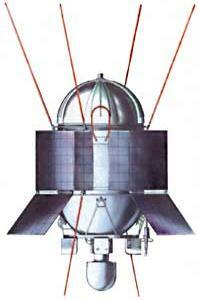 The DS-U2-GF satellite was a Soviet solar research satellite launched as part of the Dnepropetrovsk Sputnik program. investigation of the influence of various factors space environment (meteorites, cosmic dust, fluxes of charged particles) by a coefficient of specular and diffuse reflection mirrors astronomical instrument. The only satellite of this type satellite, Kosmos 262 was launched on 26 December 1968 on a Kosmos-2 booster from Kapustin Yar. It operated until 3 May 1969 and decayed from orbit 18 July 1969.